It has been a chastening few months for gas-rich Turkmenistan. Two long-standing energy buyers have indicated they will stop purchasing the country’s natural gas, potentially leaving Ashgabat dependent on Chinese demand. An ambitious pipeline to India and Pakistan via Afghanistan – dubbed TAPI – could offset Ashgabat’s looming dependence on Beijing. But despite some noise in recent months, the export route looks no more feasible now than it was when first proposed in the 1990s, experts say. Turkmenistan has the fourth-largest gas reserves in the world. But inadequate pipeline infrastructure limits the landlocked country’s export ability. Only the Turkmenistan-China gas pipeline, built by the China National Petroleum Corporation in stages since 2009 and projected to transport 55 billion cubic meters (bcm) of gas east annually by the end of 2015, links Turkmenistan to a market with real potential. But for an avowedly “neutral” country, ever-increasing dependence on China presents a dilemma – one that could potentially weaken the domestic position of President Gurbanguly Berdymukhamedov’s regime, which rights activists say is one of the most repressive on earth. This summer, Iranian Oil Minister Bijan Namdar Zanganeh signaled that Iran would focus on domestic production and would no longer look to buy Turkmen gas. Meanwhile, executives at the Russian energy giant Gazprom have repeatedly raised the idea of annulling contracts with Central Asian suppliers, specifically Turkmenistan and Uzbekistan. Russia and neighboring Iran – both gas producers themselves – were never ideal export markets for Ashgabat, but their combined intake of 15-20 bcm of gas annually in recent years provided a nice cushion for Ashgabat against hard-bargaining China, which would be in a stronger position than ever to dictate prices if it became the exporter’s sole customer. The major unanswered question at this stage is Iran’s determination to follow through on its domestic production intentions. Though some observers have interpreted Zanganeh’s statement as a bluff designed to force Iran’s gas import price down, Tehran is undeniably looking to expand production and build up its own infrastructure, a factor that may bring it into fiercer competition with its northern neighbor, Turkmenistan. Against this backdrop, and with a long-stalled trans-Caspian link to Europe complicated by disagreements over the territorial status of the inland sea, the TAPI project has become increasingly important for Turkmenistan. Speaking to the Council of Elders on October 29, Berdymukhamedov said he expected TAPI to be operational by 2017. Although the project is endorsed by the Asian Development Bank, and the ADB hired British engineering outfit Penspen last month to carry out a feasibility study, few outside the president’s coterie of yes-men share his optimism, and not only because the pipeline route would have pass through war-torn Afghanistan. TAPI faces other serious problems. “To finance any pipeline of this scale, you need a robust, creditworthy, and credible shipper to guarantee to ship gas through the pipeline,” said Laurent Ruseckas, an expert on the region’s oil and gas production at Veracity Worldwide, a London-based consultancy. “[State-run] Turkmengaz does not yet have that sort of profile in capital markets,” Ruseckas noted. Chevron, ExxonMobil, Total and Malaysia’s Petronas have all been reportedly interested in TAPI. Yet, investors have been put off by Turkmenistan’s refusal to offer a stake in its gas fields, rather than mere ownership of a high-risk pipeline. 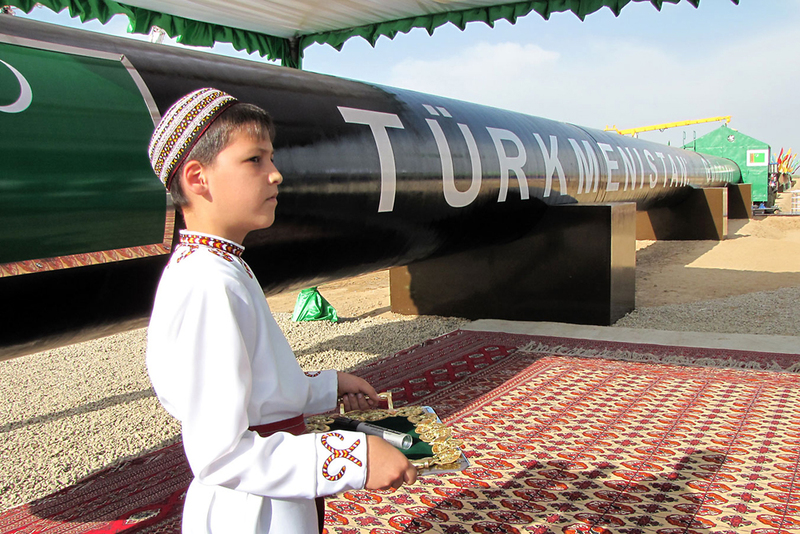 “For now there is still no sign at all that Turkmenistan is willing to give direct access to onshore gas in connection with TAPI,” Ruseckas told EurasiaNet.org. While the main downstream beneficiary of TAPI would be the Indian market, where demand for energy far outstrips supply, Indian officials have publicly expressed reservations about the pipeline plan. New Delhi would be uncomfortable about a pipeline traversing rival Pakistan unless Islamabad had significant “fiscal and sovereign risk” tied to the project to dissuade it from using transit as political leverage, said Rahul Tongia, an energy expert with Brookings India. Imports of liquid natural gas (LNG) by sea offer India greater flexibility than a pipeline, he added, noting that Turkmenistan is not a major LNG producer. “Some of these things are easier said than done,” said Tongia, referring to TAPI. Pakistan appears more interested in setting up a gas-import arrangement with Iran, potentially undermining its need for TAPI. On October 31, Pakistani media reported that Iran and Pakistan had agreed to transport LNG from Iran to the Pakistani port of Gwadar. The deal is under a cloud due to international sanctions against Iran, but Tehran seems confident these will be lifted soon. In the past, according to Luca Anceschi of the University of Glasgow, Turkmenistan has only diversified exports routes when dependence on one party was seen as “detrimental for [internal] stability.” It was such reliance on Moscow that pushed Ashgabat towards China in 2009. “Now it has reached such a place with China,” Anceschi said. More than the breakdown of the Moscow-Ashgabat gas relationship, wherein the Kremlin bought cheap and resold at a substantial profit to European markets, “the dismantlement of the relatively successful energy relationship between Turkmenistan and Iran will lead to a thorough realignment” in gas markets across Eurasia, Anceschi predicted. Chris Rickleton is a freelance writer who specializes in Central Asia.